— DR, LR & MB, Another Happy Client! — J & H P, Another Happy Client! Trish is on her game and people like that! I would refer her to anyone looking to a realtor! Trish is a great realtor with a lot of knowledge and a wonderful personality. You can’t ask for anything more! — Another Happy Client!, Another Happy Client! Trish was wonderful – available 24/7 for questions, helped us navigate through e-signing on our computers/phone and never failed to make things easier for us and went out of her way to get things done. There are none better than Trish and Boston Connect. All “i’s” dotted and all “t’s” crossed. Trish was amazing! She answered every question I had and was so patient with me as a first time home buyer. She explained every step of process to me in detail and always answered my questions quickly either via text, phone, or email. I always knew she would get right back to me. 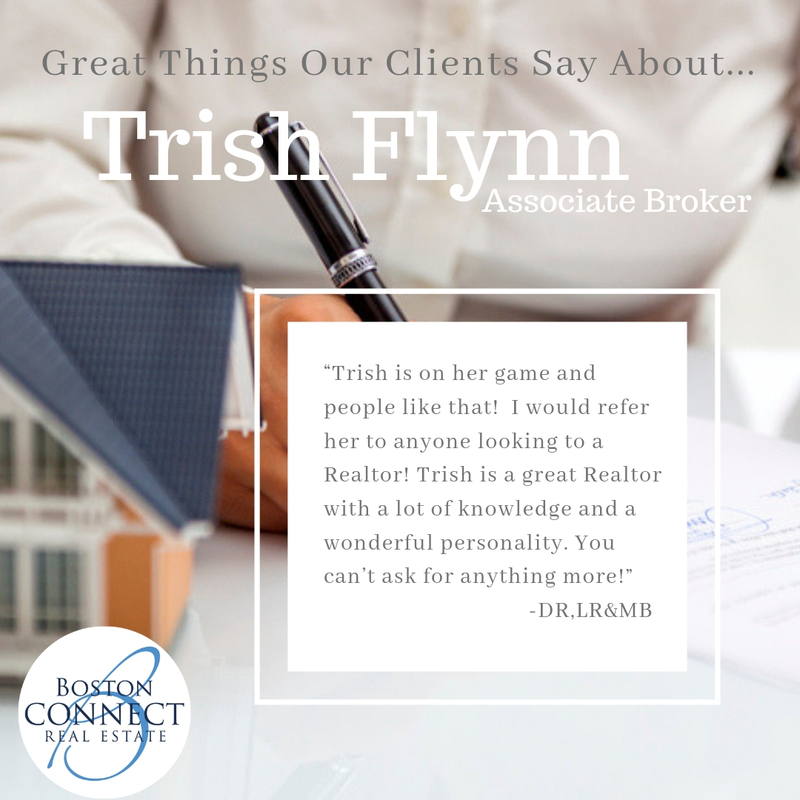 I would recommend Trish to my friends and family or anyone looking for a Real Estate agent. Thank you Trish! Trish is extremely professional and knowledgeable and made the entire process less stressful for us. We will certainly recommend her. Trish is fabulous. We’ve worked w/her before and highly recommend! Both Janice & Trish have been a pleasure to work with. They are both VERY Good at what they do! I look forward to working with them in the future! Trish is the best agent we ever worked with. She was always more than willing to help us in every way possible. Everyone we meet we tell them if they need to sell or buy a house to contact Trish. I wish I had another house to sell so Trish could be our agent again! 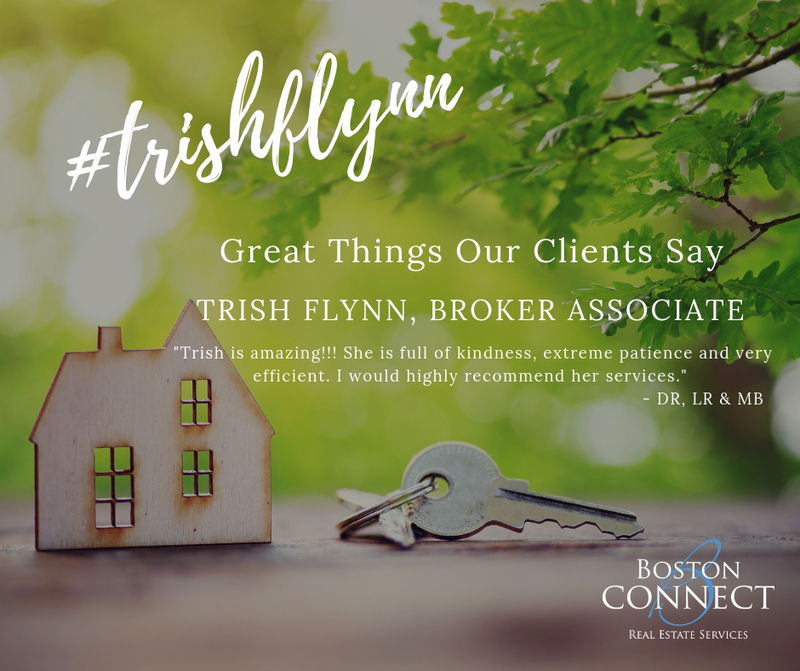 Trish was absolutely awesome…she helped us through a very difficult process. I will be in touch with her the next time I am in the market for a a home. Trish is awesome. She had sold our home in Plymouth in 7/2016 and did such a wonderful job that we did not hesitate to contact her for the purchase on our new home. She is a true advocate for her clients and handles everything. So responsive and so nice to work with. I would recommend for anyone selling or purchasing a home to use Trish. I have used Trish twice now and also have recommended her to co-workers and family. She is amazing, we couldn’t have found our dream home without her expertise. We will continue to pass her name along to family and friends. We can’t thank her enough. “I can’t even begin to tell you how thankful we are for the day we walked into that Open House in Hanson. That was the beginning of a business relationship that turned to a friendship. We just fell in love with your honesty, kindness, thoughtfulness and so many other qualities, the list is too long. It was been such a pleasure to work with you during the process of selling & buying our home…both times! Thank you for always putting up with out pickiness. I know it was frustrating at times, but you always handled it in true “Trish” fashion and that is what we love about you. You are a true professional with true feelings. Never change!